The Chenopodioideae are a subfamily of the flowering plant family Amaranthaceae in the APG III system, which is largely based on molecular phylogeny, but were included - together with other subfamilies - in family Chenopodiaceae in the Cronquist system. Food species comprise Spinach (Spinacia oleracea), Good King Henry (Blitum bonus-henricus), several Chenopodium species (Quinoa, Kañiwa, Fat Hen), Orache (Atriplex spp. ), and Epazote (Dysphania ambrosioides). about 26 genera, see text. The Chenopodioideae are annual or perennial herbs, subshrubs, shrub or small trees. The leaves are usually alternate and flat. The flowers are often unisexual. Many species are monoecious or have mixed inflorescences of bisexual and unisexual flowers. Some species are dioecious, like Spinacia, Grayia, Exomis, and Atriplex. In several species of tribe Atripliceae, the female flowers are without perianth, but enclosed by two bracts. The species with a perianth have up to five tepals. The seed is horizontal or vertical, with annular or horseshoe-shaped embryo. The subfamily Chenopodioideae is distributed worldwide, but originates from Eurasia. The genera of this subfamily were formerly classified in family Chenopodiaceae in the Cronquist system. Tribus Atripliceae C. A. Mey. (Syn. Chenopodieae Dumort. ): Fuentes-Bazan et al. 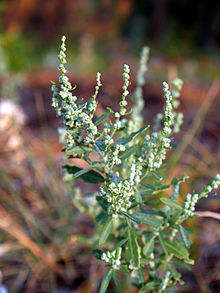 (2012) include here also Chenopodium and related genera, as Chenopodiastrum, Lipandra and Oxybasis. Archiatriplex nanpinensis G.L.Chu: endemitic in the Chinese province Sichuan. Baolia bracteata H.W.Kung & G.L.Chu, endemitic in the Chinese province Gansu. Chenopodium L. - goosefoot (sensu stricto, incl. Einadia Raf. and Rhagodia R.Br. ): with about 90 species worldwide. Exomis microphylla (Thunb.) Aellen: a subshrub in southern and western Africa growing in gardens and hedges. Holmbergia tweedii (Moq.) Speg., a shrub in Bolivia, Paraguay and Argentina. Manochlamys albicans Aellen: a subshrub in southern Africa, Namibia and Cape province, growing on rocky an sandy slopes, sand dunes and road sides. Microgynoecium tibeticum Hook.f. : in Tibet and Sikkim, growing in alpine meadows and on disturbed sites. Proatriplex pleiantha (W.A.Weber) Stutz & G.L.Chu, an annual herb from western North America. Suckleya suckleyana (Torr.) Rydb., a succulent annual from western North America. Teloxys aristata (L.) Moq. (Syn. : Chenopodium aristatum L., Dysphania aristata): from Eastern Europe to temperate Asia, naturalized elsewhere. Susy Fuentes-Bazan, Pertti Uotila, Thomas Borsch (2012): A novel phylogeny-based generic classification for Chenopodium sensu lato, and a tribal rearrangement of Chenopodioideae (Chenopodiaceae). In: Willdenowia. Vol. 42, No. 1, p. 5-24. ^ Susy Fuentes-Bazan, Guilhem Mansion, Thomas Borsch: Towards a species level tree of the globally diverse genus Chenopodium (Chenopodiaceae). In: Molecular Phylogenetics and Evolution, online 22 October 2011, ISSN 1055-7903, . ^ "Teloxys aristata". Germplasm Resources Information Network (GRIN). Agricultural Research Service (ARS), United States Department of Agriculture (USDA). Retrieved 26 November 2015. Wikimedia Commons has media related to Chenopodioideae. "Chenopodioideae". National Center for Biotechnology Information (NCBI).